The Catholic liturgical calendar begins on the First Sunday of Advent. Having a Catholic liturgical calendar is so handy to remind us of the Catholic holy days of obligation and the feast days through the liturgical year. It's great for remembering our favorite Catholic saints, too. Different countries have different dates for the Catholic holy days, even year to year so it is almost necessary to have a local ordo to go with your calendar, watch your parish bulletin or Missal; but many dates remain the same every year. Advent starts the liturgical year. 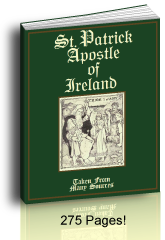 You can find a current Catholic liturgical calendar or Ordo and Advent Calendars at Catholic bookstores or online. If you have a Missal you can follow the days from there, too. 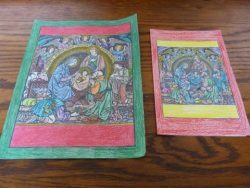 We also have Holy Day coloring pages, and Advent coloring pages here. The main dates on the Catholic calendar are in the list below and below that are sources to find and purchase a calendar to track the variable dates like Ash Wednesday, Easter, Ascension Thursday, Pentecost, Advent and the different Catholic saints feasts throughout the year. Here is a Universal Catholic Holy Days of Obligation list. Would you like a Holy Days reminder? We have a Catholic Holy Days Of Obligation Reminder at the same link, a near monthly ezine, that reminds you to mark your calendars. The Advent season has its Advent prayers, Advent wreath and the Advent candles; yet what is the Roman Catholic Advent Season? 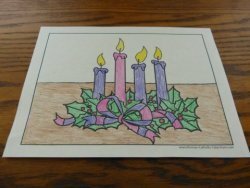 Do you have favorite Advent crafts for children? 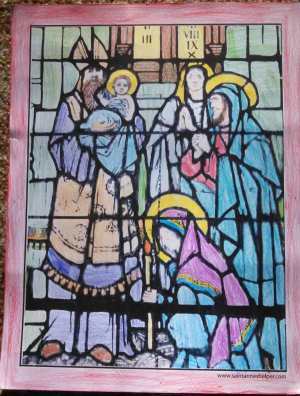 See the our visitors have submitted for the Advent season or see our Printable Advent Calendar. 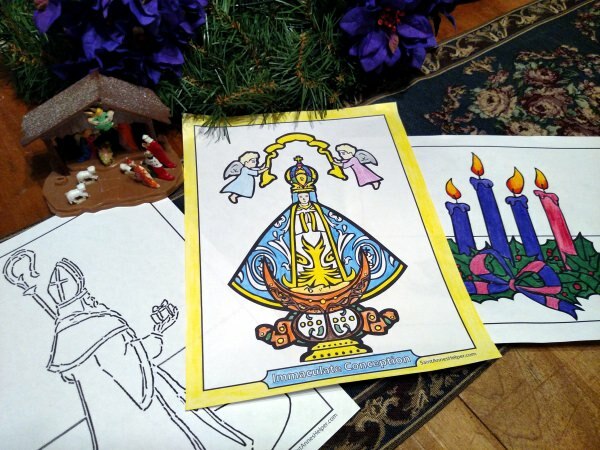 Remember to check our free Christmas coloring pages early enough to color and mail them to family and friends. Same with our free printable Christmas cards. The first Holy Day of Obligation on the Catholic liturgical calendar venerates Mary's privileged Immaculate Conception, December 8 and it is the United States of America patron feast. 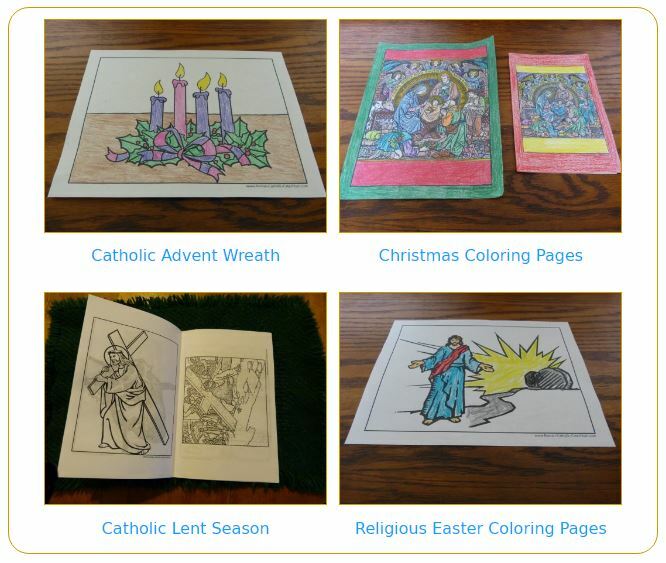 Use our Catholic Holy Days Of Obligation coloring pages to help celebrate the Holy Days of Obligation throughout the years. Christmas is the second Holy Day of Obligation on the Catholic liturgical calendar and it venerates Jesus' birth, which is also the reason for the third Joyful Mystery of the Rosary, the Nativity. Share your favorite Catholic Christmas traditions (Christmas in Mexico, Christmas in Italy, Christmas in Germany, Irish Christmas - all are welcome). 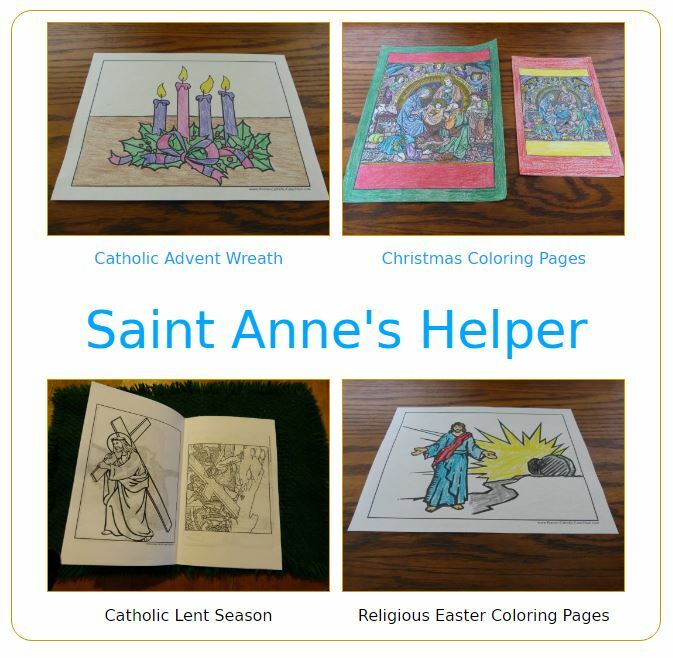 You might enjoy our Christmas coloring pages, Christmas tree coloring pages, decorating ideas, and printable Catholic Christmas cards. This is the third Holy Day of Obligation on the Catholic liturgical calendar which venerates the Naming of Jesus and His first Blood shed for us, January 1. There are many Catholic New Year's Eve traditions like making a holy hour in church with the Blessed Sacrament. What do you do to prepare for the new year? 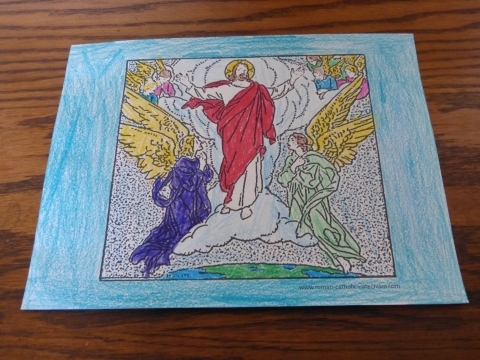 See our Rosary coloring pages for the Presentation and pictures for other feast days. What is Lent? The Lent season is the 40 days leading to Holy Week and Easter Sunday. Lent begins on Ash Wednesday and runs through Holy Saturday ending with the Easter Vigil Mass. Palm Sunday starts the last week of Lent, Holy Week, which ends with Good Friday. Catholic Lent traditions include Lent fasting, prayers for Lent, and giving something up for Lent. 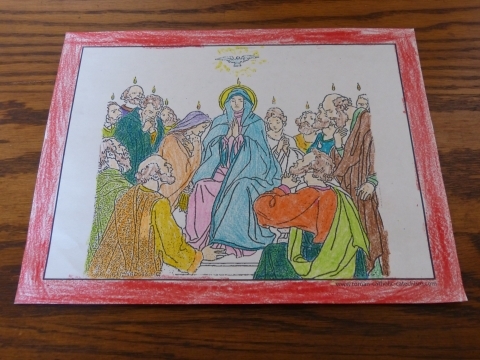 See our Lent and Catholic Liturgical Calendar Activities for Children, too. Easter Sunday is the most important feast of the Catholic religion since it is the anniversary of Jesus' rising by His own power, the very fulfilling of the Testament of His Word, the proof that He is God. 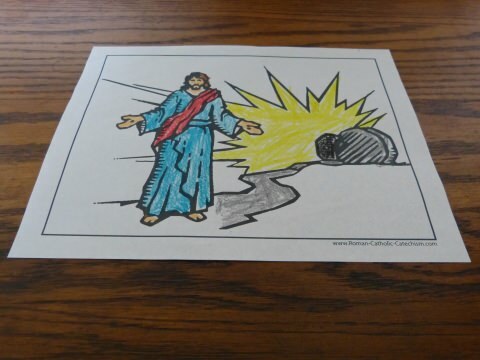 We have Printable Easter Coloring Pages. Ascension Thursday is the fourth Holy Day of Obligation on the Catholic liturgical calendar which venerates Jesus' Ascension into Heaven by His own Divine Power forty days after Easter. 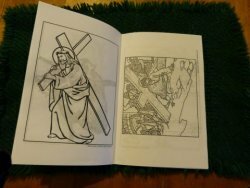 Rosary coloring pages can help you teach the Ascension and Glorious Mysteries of the Rosary. Pentecost is the birthday of the Catholic Church which venerates the day the Holy Ghost descended on the Apostles and the Blessed Virgin Mary, the day of their Confirmation! 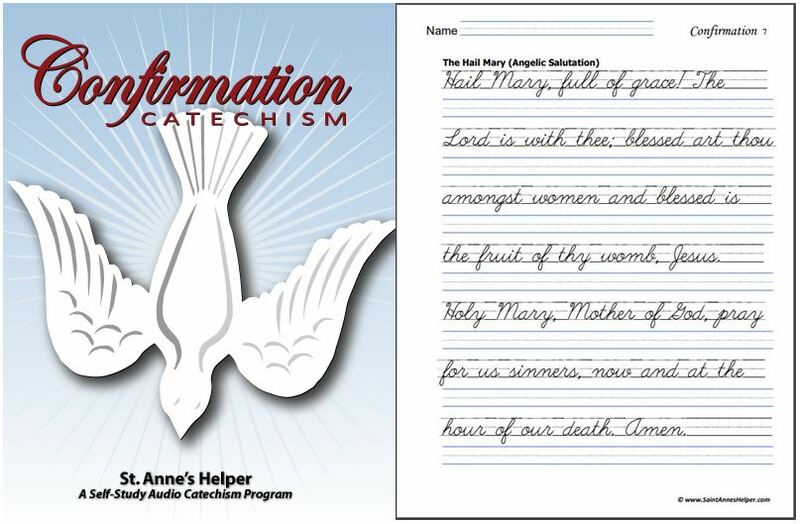 What are your favorite Catholic Pentecost or Catholic Confirmation activities or crafts? Pentecost Sunday is the anniversary of the Descent Of The Holy Spirit and is commemorated by the third Glorious Mystery. This the fifth Holy Day of Obligation on the Catholic liturgical calendar and it venerates Mary's Assumption into Heaven, body and soul August 15. 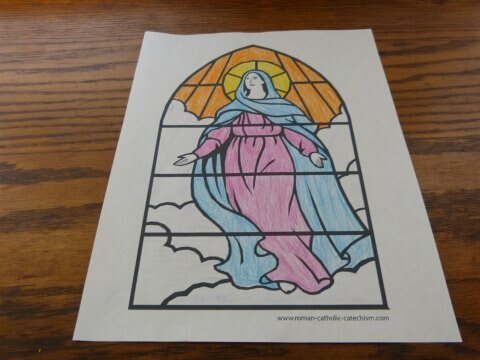 We have some Assumption Of The Blessed Virgin Mary coloring pages to help teach the Glorious Mysteries of the Rosary. The sixth Holy Day of Obligation on the Catholic liturgical calendar which venerates all of the saints November 1. See more Catholic saints here. The monks at this Benedictine monastery have a beautiful desktop calendar with excellent pictures of their daily life as well as the Catholic feast days and a quote for the day. It now has the traditional Benedictine dates, too. Be sure to try their wonderful Abbey Roast Gourmet Coffee. I can smell it now. 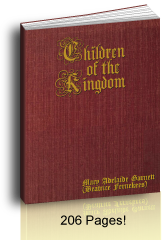 They also sell many excellent, and some hard to find, rare Catholic books and books from good Catholic book publishing companies. What is great about their list of Catholic books is that it has ecclesiastical approval. They also sell magnificent calligraphy supplies, prints of the saints, crusader toys and more. 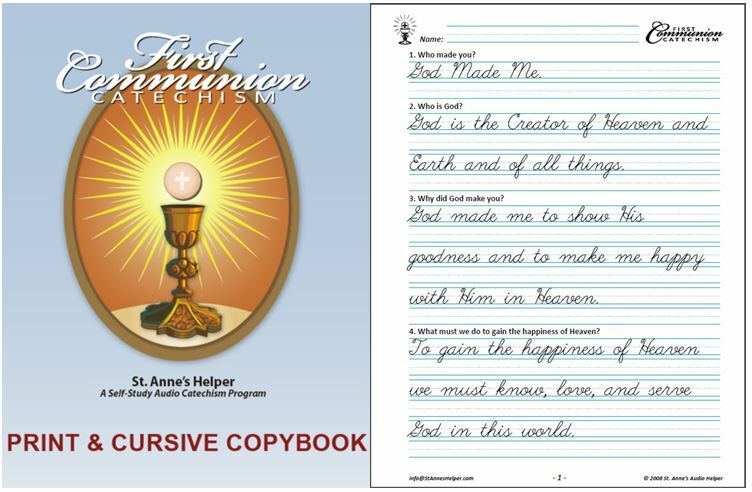 Call 1-575-388-9279 to request their beautiful full color catalog of Catholic books and gifts. Many thanks to the Benedictine Fathers and Brothers there. The following are the places that we have found to buy the Catholic liturgical calendars that coordinate with the 1962 Catholic Missal (which makes it easy to coordinate the date to the Catholic feast day Masses found in various old Missals with the appropriate Ordo. Are you looking for the names of Roman Catholic saints or even particular patron saints? The Catholic calendars have the saints names on the Catholic feast days which is handy when a new baby is born and you want the saint's name the same as the Baptismal name. Some Catholic calendars have separate lists of patron saints in the back which is very handy when you have a particular theme and want to know which is the patron saint for that theme. If your friend is a fireman, you can find the patron saint of firemen by using this patron saint list and then find an appropriate gift or card for that theme. We know a town that raised funds for its fire barn by selling remembrance bricks. One townsman bought bricks that said "St. Florian, pray for us." The ideas are endless, and a good list of patron saints is so helpful. So many Catholic Liturgical Calendar Activities!